Education officials have warned parents that children who took part in an anti-war demonstration on Tyneside without permission will be classed as truants. The warning, from Newcastle City Council, followed a demonstration by more than 250 youngsters who skipped lessons on Wednesday. 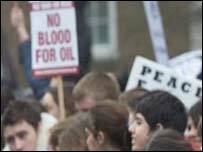 Similar demonstrations were mounted in several British cities in protest at likely UK involvement in a war with Iraq. Police in Newcastle ushered the youngsters between Newcastle civic centre and the city's monument square. They included students from Heaton Manor and Gosforth High schools in Newcastle and Queen Elizabeth High School in Hexham. Tony Webster, headteacher at the Queen Elizabeth school, said he was unaware of any demonstration planned for Wednesday. He said: "As far as I am concerned I didn't know that any of our students would be attending the march. "If they should have been in lessons, then we do a complete check on attendance at every lesson in the sixth form every day. "People who were not in lesson and who should have been will be followed up using the normal procedures." A spokesman for Newcastle City Council said any unauthorised absence by pupils will be treated as a truancy issue. He said the parents of those pupils will be contacted about the situation.